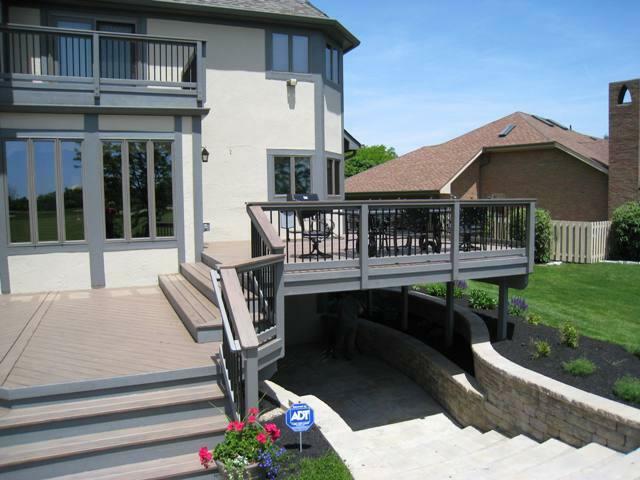 Your Columbus deck doesn’t need to be built in just various shades of brown. Let’s talk about color! 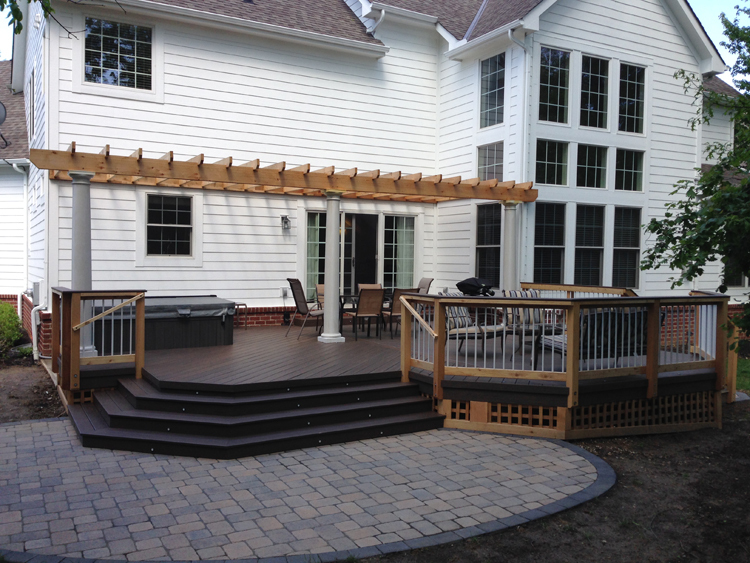 Both the TimberTech Legacy decking and the pergola contrast the white home exterior. Look what a great statement contrast can make! When many people think of decking colors, they generally think in shades of natural wood that range from the very common pressure-treated pine to dark hardwoods shades found in ipe or other Brazilian hardwoods. This provides a large array of color options. But add all the color options within the synthetic decking lines, and you have a virtual rainbow of colors from which to choose to build your deck or porch. People who are unsure of the options available often choose to match the outdoor living space to the existing house. That’s always a good option. But you might also want to take a look at some of the other colors available. For most projects you have the option to pick two, three or even four colors as part of the design process if you choose. strong contrast color to your house will really make your custom space stand out. But your color choices don’t have to stop there. Today’s homeowners are choosing a variety of color for their new custom space to add visual interest and appeal. Here are some fun options. We can add a contrasting border which will set off the color you choose for the rest of the flooring. If you are going to add a railing, it can have a different color and the posts that sit atop the railing can contrast or compliment as well. The slats between the posts can also have a distinct shade. One of our suppliers, TimberTech, has a visualizer web tool that you can use to get an idea about what I’m describing. It’s very useful and pretty fun. 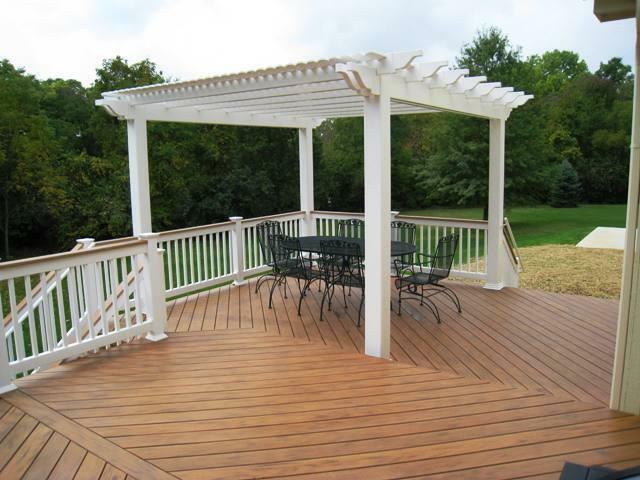 This Columbus TimberTech deck features a white vinyl pergola serving for added shade and maximum aesthetic appeal. to spruce up the whole area with different colors that will make it look like a brand new space. For example, a white pergola that picks up the trim color from your home is a great contrast to an alternately colored deck. With color, you can really personalize the project and give it a custom look. Your deck won’t look like five other ones in the neighborhood. Color is often the best way to create a one-of-a-kind project without spending extra money. If you think you’d like to explore some different color options, we’d love to offer a free consultation to discuss the new space you have in mind. I’ve been building decks in the Columbus market for more than 10 years and I’ve build decks in every size, shape and color. That experience helps with recommendations and by giving me a huge photo library to show you in helping you design your new Archadeck space. Previous Previous post: Are built-ins out for your Columbus deck?